Recently, as part of orientation to a new job, I went on a tour of a local foodbank and was very nearly reduced to tears. It is hard to put into words just how distressing I find the plight of fellow human beings for the bare basics of food in order to subsist. It is a devastating state of affairs that since 2012, 14,000 people (nearly a quarter of whom are children) in communities across Scotland have found themselves in such desolation that they have been forced to have to ask for donated handouts of basic food rations. 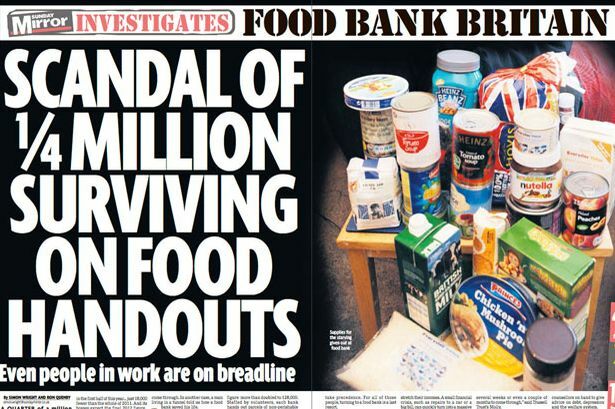 Nothing symbolises the desperate domestic times we live in more than this increasing prominence of foodbanks. And it’s only getting worse. One look at the disaster/aggressive assault on society’s most vulnerable that is the phasing out of Disability Living Allowance into Personal Independence Payment and you’re faced with sanctions within four weeks of failing to respond to your “invitation” to apply and cancelled claims after eight, leaving people with another twelve weeks without income waiting for DWP to bother their arse to process the new claim. And that’s a claim for a shittier and even more horrifically assessed benefit – don’t walk those twenty metres from the bus stop pal or your journey’s already wasted as ATOS is gunna get you hard, right in the baws for being such a nauseating drain on society with your chronic condition/disability/mental health diagnosis. A bleak prophecy yes, but one which is imminent and only one example of the disgraceful situations which are and will be driving people to foodbanks in every corner of the nation, screaming of a level of deprivation, poverty and desperation that no-one of any conscience or moral fibre should be comfortable with on any level. But this is Tory Britain and Tory Britain is a heartless, selfish brute. Like all things associated with the “undeserving poor” of Great ol’ Blighty, the myths and blame rhetoric around food banks has been rampant. 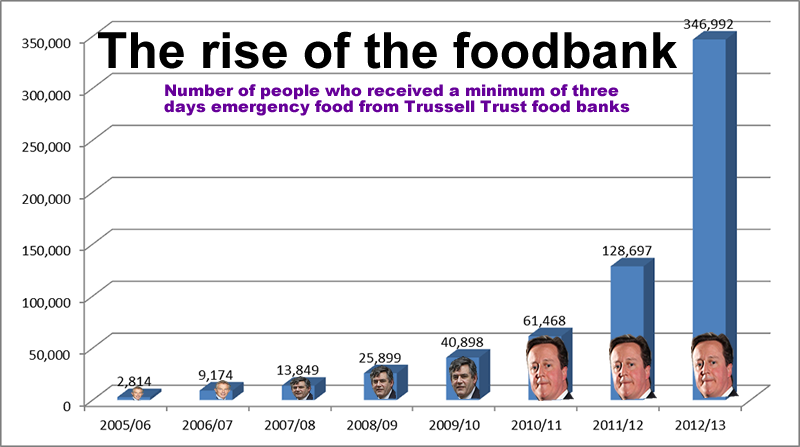 The right-wing response to foodbanks has actually managed to surpass predictable and enter the realm of unbelievable. Just recently (well I mean it’s every day but) the slimy weasel that is Michael Gove once again asserted himself as the biggest wretch in the union with his declaration that foodbanks are merely the refuge of those who can’t budget, followed this week by Paul Maynard jumping on the blame rhetoric with the traditional classist references to the wee dirty bad habits of the poor. These people are in a vulnerable position and need these foodbanks to survive, most do not stay on foodstamps indefinitely but use one of the Purple Payday loan services for example to get out of this position. The myth-making, the self-interested lies, blaming and finger-pointing are breathtaking in both ignorance and offensiveness and are so desperately far removed from the type of society I want to live in and the type of independent progressive Scotland that we at ATF have aspirations for. Thank god for foodbanks eh? Well…yeah…but…Ok so they stop people starving but they’re no long term option. These are the very basics – fuel for the body in order to stay alive. Unfortunately, it is an uncomfortable truth that alongside payday loans (another source of hardship which Margaret sees as a reason for people coming through the doors, having often already used the money they’ve borrowed for, well….food), foodbanks are increasingly being accepted as another unofficial layer of the welfare state. That’s just not ok with me. Without reverting to boring old lefty speak about the cover-up role of the charity sector, if they must exist foodbanks should be the desperate, short-term measure, not the creeping permanent fixture which they seem to be morphing into with MPs cutting the ribbons like they’re new nurseries or leisure centres. But this is the Big Society isn’t it? Communities and churches rallying round in times of need – a rosy picture of community cohesion indeed, that is if it weren’t for the, y’know, acute poverty driving it. Peasants! Give those range rover mums with some spare time something to do, some cakes to bake! 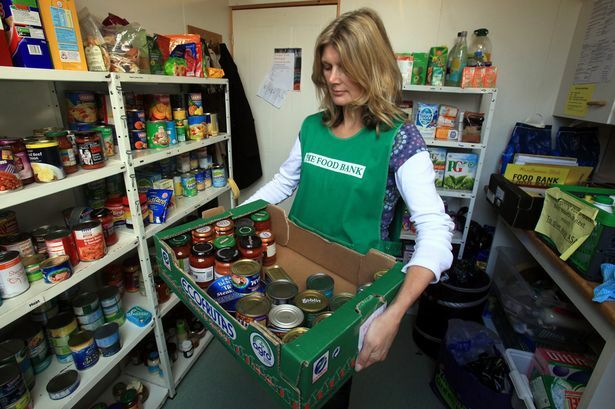 It feels as though across the UK there is a worrying sense of growing complacency, of acceptance of foodbanks as part of the community landscape. Of course, on one hand this helps combat stigma and makes it easier for those who need help to ask for it but this is a dangerously slippy slope which essentially allows Cameron et al to negate their duties to ensure that citizens are consistently afforded at least the very bare basics, and allows them to continue to wage their war against the deprived and vulnerable. Responses at the food drives at local supermarkets are fantastic Margaret tells me. That’s great I say, but I just hope people don’t come to see that as a norm which is established and ok, not because people don’t deserve handouts but because handouts on this scale are nothing but acute markings a society which is failing to be truly politically and socially responsible. “We’re pre-welfare state” Margaret states bluntly. I couldn’t agree more I tell her, and it’s breaking my heart. *Name has been changed on request. Say he smiles, if you hear him sigh; if pale, say he is ruddy. William Blake The Four Zoas 1807.